Invest in your well-being! Wellness is for employees, family members, and retirees on the County medical program. 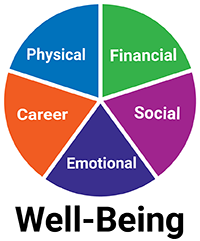 We have a variety of programs and classes supporting the 5 areas of well-being: Financial, Physical, Emotional, Social, and Career.